Ern Cutts was (and still is) the youngest of seven children in his family. One brother was ground staff in the Royal Australian Air Force. Two other brothers were in the AIF. A sister was a RAAF nurse. His other two sisters were married to servicemen. So it was just about inevitable, as soon as he turned 18, that Ern would himself enlist. There was just one small hurdle to jump first. His father. Think about it for a second. Four of seven children were already in the services. Two others married to servicemen. Surely that was enough? Ern had the doubtful honour of being my first victim interview subject for the International Bomber Command Centre’s Digital Archive. My first sight of him was of an older but still fit-looking gent waving his arm at me as, about 10 minutes late, I sailed straight past the entry to his retirement complex on my motorbike. I turned around and rumbled up the path towards him, and he warmly shook my hand, grinning, and led me to the unit where he and his wife Beryl live. I’ve been visiting veterans much like Ern for a number of years now, but the IBCC project is the first time I’ve done formal, recorded interviews with them. Perhaps I looked a little nervous as I grappled with my recording equipment. “Take your time”, Ern said. 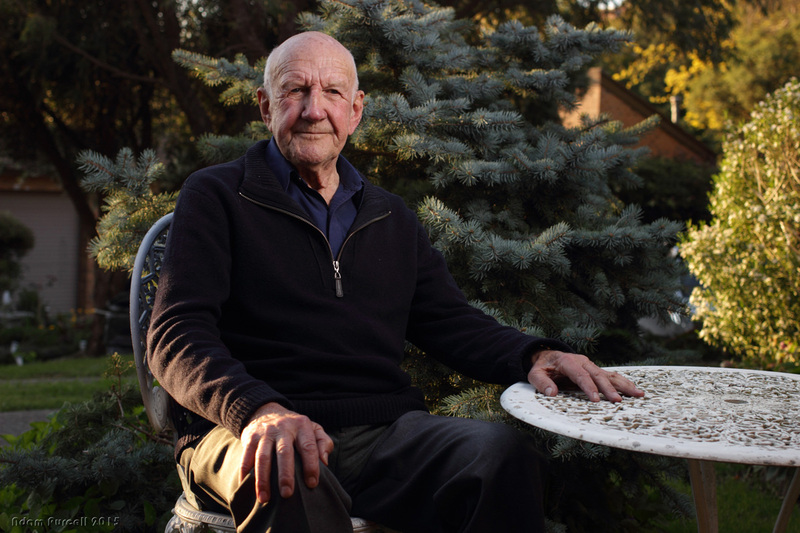 It was one of the first beautiful spring days in Melbourne this year and the birds were twittering outside as, opening the front door (“to shed some light on the subject,” he said with a chuckle), with everything ready and Beryl sitting quietly on the other side of the room listening in, we began. Logbooks are always a favourite thing for me to look at when I’m talking to veteran aircrew because they allow me to put in some sort of context their owner’s service. Most are fairly dry, but others include comments about particularly memorable trips. Ern’s even had a number of pictures stuck to the pages, of aircraft he’d flown in. And a Messerschmitt 410, a German nightfighter. Part of the IBCC project is to scan original documents for inclusion, along with the interview itself, in the Digital Archive, so I carry a scanner to hook up to my laptop and copy any originals on the spot. At the time I missed the significance of the ME410. But when I was at home later, reviewing the scans, there it was. 7 February 1945. Halifax III. Pilot: Flying Officer McCallum. Operation No. 24: 6:00 to Goch (Army Cooperation Target). FIRST KILL – ME410 FIGHTER CONFIRMED. Ern actually shot down an enemy aircraft. This is less common than you might think for a wartime gunner. British bombers at the time were armed with Browning .303 machine guns – with an effective range of some 400 yards. Nightfighters, on the other hand, usually had cannon with a maximum range of about 1,000 yards. The inevitable result was that the favoured method of attack was for a fighter to stand off, undetected, outside the range of the Brownings and fire at leisure. The best chance of escape for the bomber crew was in spotting the fighter before it saw them. Many gunners who survived a tour, then, did so without firing a gun in anger, let alone actually scoring any hits. Having a confirmed kill to his name is actually quite an achievement. And during our interview, about shooting down a nightfighter he said exactly nothing. He was similarly reticent when I enquired about an immediate DFC awarded to his pilot, the aforementioned F/O A.B. McCallum, after the aircraft was hit by anti-aircraft fire on a trip to Gelsenkirchen (Ern’s 9th) in November 1944. It wasn’t anything out of the ordinary, Ern suggested. Otherwise it would be remarked upon in his logbook. Most likely it’s that legendary modesty often found in veterans of Bomber Command coming through here. They didn’t think they were doing anything special: there was a job to do, and it fell on their shoulders to do it. And so their stories frequently concentrate on the lighter side of life in wartime England. 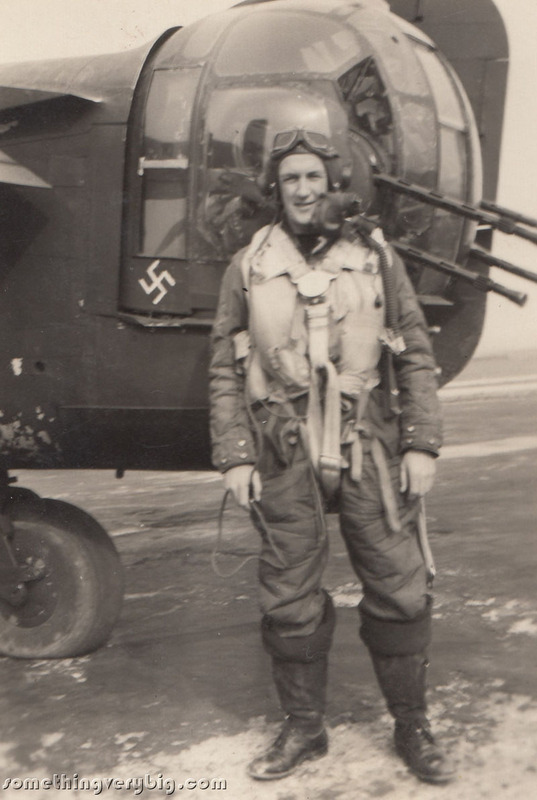 Finishing his tour in March 1945, Ern was eventually posted to 467 Squadron at Metheringham, preparing to begin training for Tiger Force to continue the war against the Japanese. After the atomic bombs ended the requirement for that he flew a couple of POW repatriation flights, taking part in Operation Spasm to Berlin and Operation Dodge to Bari in Italy in September 1945. Both trips, he told me, were completed with all non-essential equipment stripped from the Lancasters. Including all the guns and all the ammunition. I had to ask the obvious question. If there were no guns on board, why did they need gunners? The tone turned a little more serious, however, when I asked Ern how he thought Bomber Command was remembered. There was a lengthy pause before he answered. And that, I thought, was a beautiful way to finish our interview.